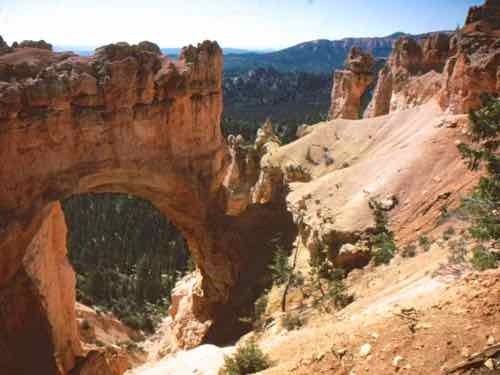 If you're touring the American West, Bryce Canyon National Park will have to be on your list of places to visit. Has to be? Well, it really is one of the great canyons that you shouldn't miss. It's located in south western Utah. ...and often wins reviews from visitors as a favorite for its unique geology. So what's unique about it? They're everywhere you look. Do you know what hoodoos are? "A hoodoo is a tall thin spire of rock that protrudes from the bottom of an arid drainage basin or badland." Hard rock on top protects softer stone below from rain and erosion. What you end up with is pinnacles or spires of rock... but hoodoos come in a variety of shapes and sizes and thicknesses. 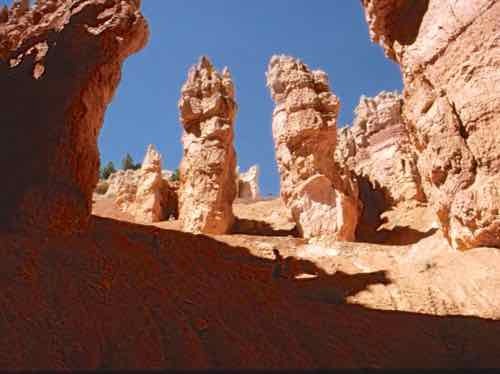 It's the size and shape and color of the hoodoos that have visitors to Bryce Canyon National Park feel like they're visiting a fairy land. The Park Service recommends starting at Rainbow Point in the south of the park. From there you can look out over the whole park. If you are going to hike all day, be prepared. Wear good hiking shoes or boots. Carry plenty of water... this means one quart (1 liter) per person for every 2-3 hours you plan to be hiking. If in doubt, take more than you think you'll need. Parts of the park are at an elevation of over 9,000 feet (2774 meters). Hiking at this altitude will take a lot out of you if you're not used to it. You can hike the Rim Trail. If you do the whole trail it's 11 miles (17.7 km) round trip... but you can always just do part of it. It's considered easy to moderate because it is paved and fairly level. You get great views down onto the hoodoos from here. The hikes that go down into the canyon are considered strenuous. They are loop trails and range from 5 miles (8 km) to 8.5 miles (14.2 km). Wandering down among those hoodoos is definitely worth it. We loved trying to name formations for ourselves, though the Park Service has come up with some pretty descriptive names. Ride a horse or mule into the canyon if you'd rather not hike. There are 2 hour and 4 hour rides on that Peek-A-Boo trail. 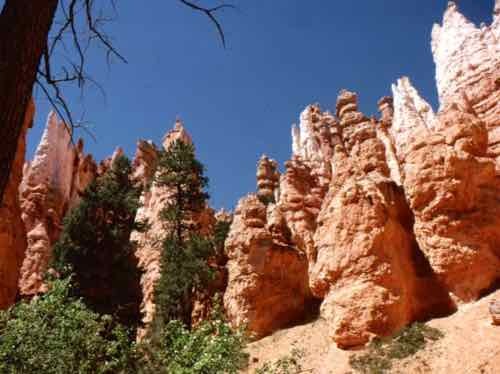 You can get to Bryce Canyon National Park driving from either Las Vegas, Nevada or Salt Lake City, Utah. Both are about 270 miles (435 km) from the park. Driving a loop from Las Vegas through several of the western national parks makes a great vacation. 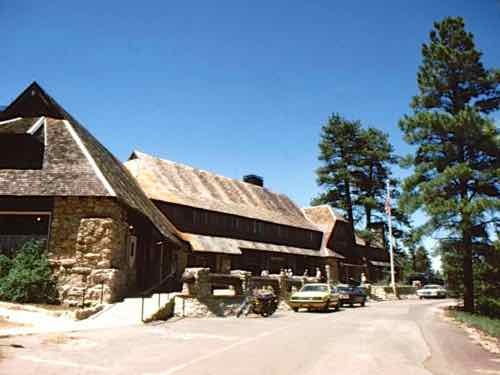 The Bryce Canyon Lodge is in the park on the rim, but it is only open from April thru October. Load up your camera and plan your trip. Those hoodoos are so photogenic that they make everyone a good photographer.